Beautiful Rosie came to Wood Green Heydon centre with her friend Rusty (below) when their owner passed away. Rosie is finding life at the centre a bit tough at the moment and would love a forever home where she can settle and gain trust with her new family. If you think you can offer lovely Rosie the home she deserves please check out her profile here. Lovely Rusty came to Wood Green after her owner passed away. She came with her friend Rosie (above). She would love a home where she can settle and enjoy all the love from a new loving family. Click here if you would like to know more about this sweet girl. 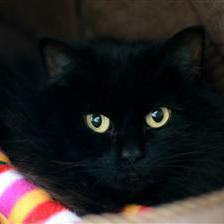 Kizzy is a long haired black beauty. She came to Wood Green after her owner moved abroad and couldn't take her. 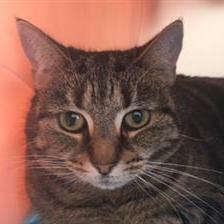 This quiet, gentle cat really likes a fuss once she gets to know you and enjoys being groomed to keep her coat nice and beautiful. She also gets along well with dogs as she lived with one in her previous home. Kizzy is also at the Heydon centre. 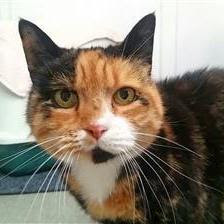 If you would like to offer her a loving forever home click here to view her profile and find out more about her. Disclosure: I received no compensation for this post. I am just sharing to help animals in need and the charities I support. As a rescue kitty myself I want to help other rescue pets find their forever home, so each week on Charity Tuesday I share adoptable cats from Wood Green, the Animals Charity (which is where I was rescued). Mum and I are so grateful to this amazing charity because without them we would never have found each other! It's also one of the main charities we support. However, this post does contain some affiliate links. This means if you click on the Zazzle links to purchase any of the items featured in this post, I will receive an affiliate commission. Such pretty kitties! Sending purrs so they find their new furrever homes quickly! They're so beautiful! We hope their new forever family comes around soon. Who could resist them? Wow! Those eyes on Kizzy...! My heart really goes out to these kitties. It has to be really hard for kitties whose owners pass away. It is tough when a family has no choice, but to give up their pets too. I hope these beautiful kitties find new forever homes soon! They definitely deserve it. I hope Rusty and Rosie get a forever home together. It is so sad when kitties owner's pass away.